In one of the tightest margins of the season, The YT Mob�s Aaron Gwin finished 2nd today after recovering from a dramatic crash in qualifying, and further extended his lead in the World Cup series to 208 points with two races remaining. The crash in qualifying meant that Aaron started around 50mins before the last rider down and eventual race winner, Danny Hart (GBR). A very large crowd lined the course here in Lenzerheide, Switzerland, where the sunshine replaced the morning grey and overnight showers. 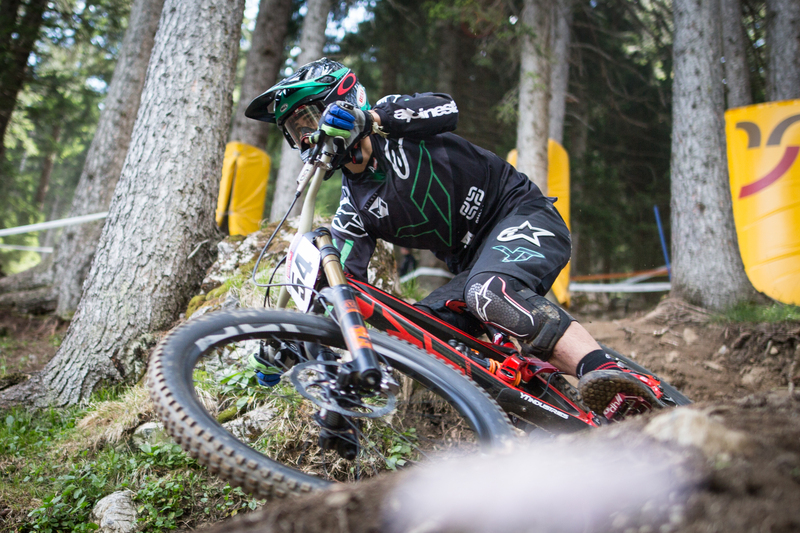 The track, despite being in a bike park had its fair share of technically challenging sections that saw many riders come undone during the week. This included Aaron�s team mate, Angel Suarez who suffered a slow leak puncture in sector 1 of his final run, which then became a massive blow-out near the end of sector 2. He crashed heavily but fortunately was not hurt. The result meant no points this weekend but he retains a solid ranking heading into round 6 in Canada. When Aaron took to the course with 15 riders to go, the lead time was 3mins and 10secs. It soon became apparent that the Series leader was keen to set a record time. To this point the fastest time of the week had been his 3m 08s in timed training, but after crossing the line with a 3m 05.8secs the word got out across the top of the mountain that the American meant business. 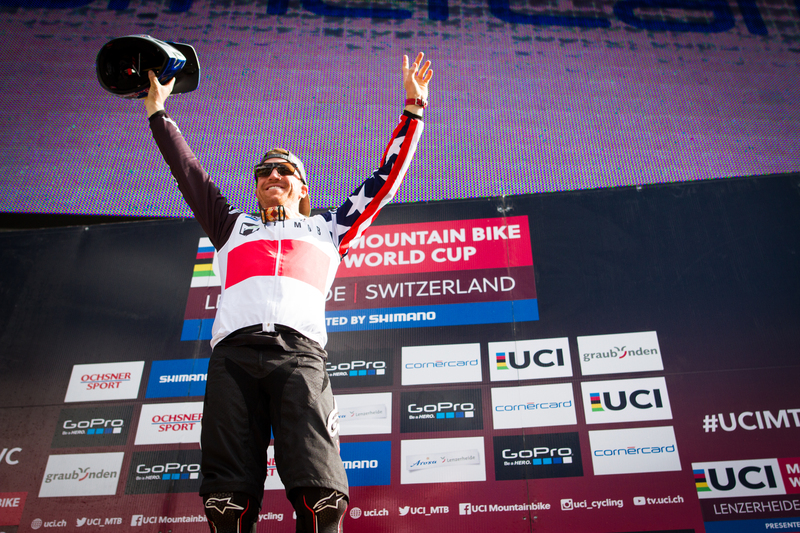 Rider after rider attempted to beat the time with the closest being Greg Minnaar (RSA), last year�s winner here in Lenzerheide, putting down a 3m 07.3secs, that being until last rider Danny Hart took to the course. All the way down Danny was close but still in the red, so it wasn�t until the 5th and final sector when he crossed the line that he�d done enough, by 0.09 of a second, to claim his first ever win. Both Aaron and Angel will contest their National Championships next weekend. For Aaron that will be in Mammoth Lakes, California and for Angel he will race in Vigo, north western Spain.